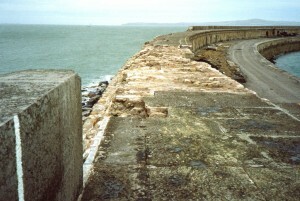 The Great Breakwater at Holyhead. Is it safe? Would anyone with any sense invest in developing in the Newry Beach area when there are genuine fears about the stability and safety of the Great Breakwater? 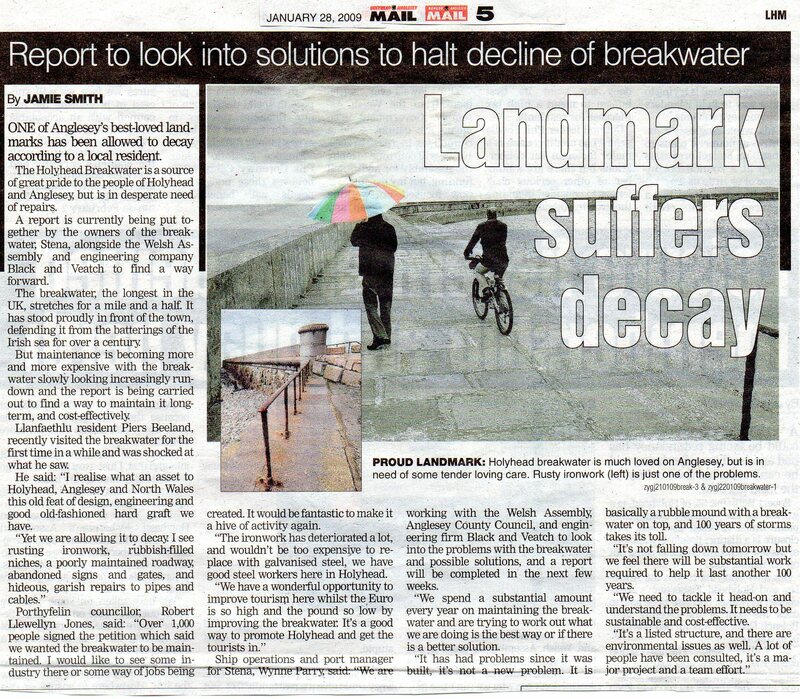 Experts have said that the Great Breakwater, a Grade 2 star listed heritage site, could breach again within the next 15 years. 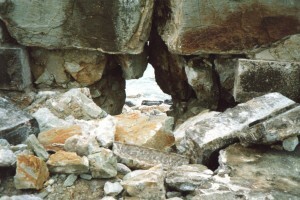 Surveys have shown that the structure’s base has been undermined in several places. When the Breakwater does breach, the whole area of Newry Beach will be at the mercy of the power and fury of major storms. Storms similar to that in 1859 which caused massive destruction will most likely occur again. The scenario could well be that sea levels along the beach will rise and the shore and marina will be battered by destructive wind and waves. Houses and apartments built on reclaimed land at Newry Beach will most likely be flooded and damaged. The Maritime Museum and Harbour Bistro, Trinity Court and the Marina will be at risk. Click here to watch a video of a rough day at Holyhead Breakwater on You Tube. So we ask again, who with any sense would invest in building at Newry Beach and round towards Soldiers Point without being assured that the Breakwater will hold back the destructive power of these storms? Anglesey County Council submitted evidence to the House of Commons Welsh Affairs Committee, Ports in Wales Report 2008-2009, saying that the Breakwater is now in need of major strengthening and restoration scheme. 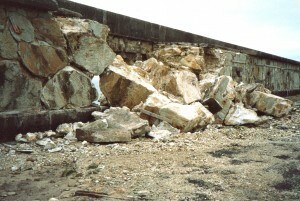 Without these works, it said, the Breakwater is in danger of partial collapse. 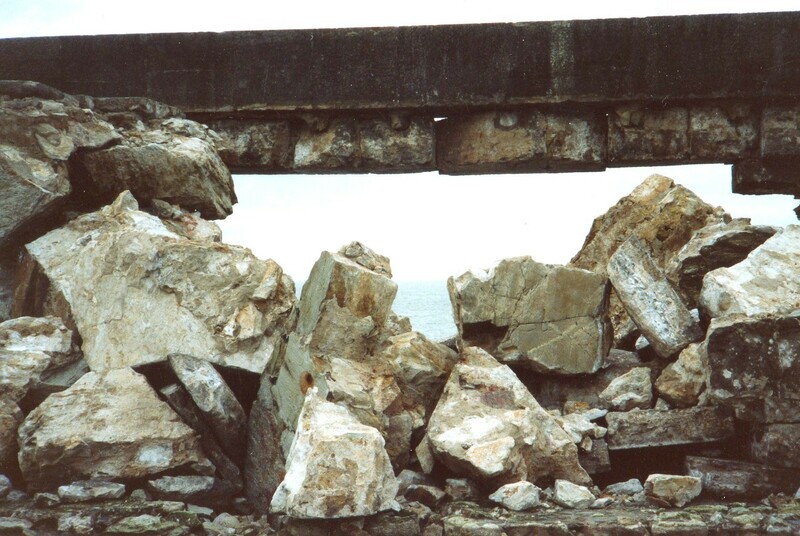 Three years later we asked Anglesey County Council (November 2012) whether there are any emergency plans in place should there be a serious breach of the Breakwater. 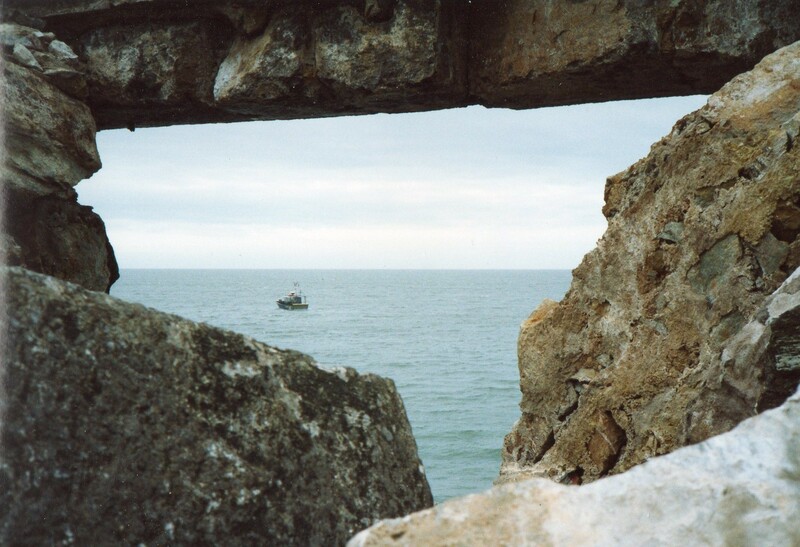 We received a reply saying there is no concern about the safety of the Breakwater. NO CONCERN!! 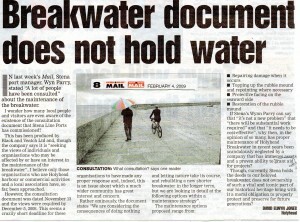 How can Anglesey County Council say this when they said in 2008/9 that the Breakwater is in danger of partial collapse? Also at risk of damage is the inner harbour and cruise ship berth. 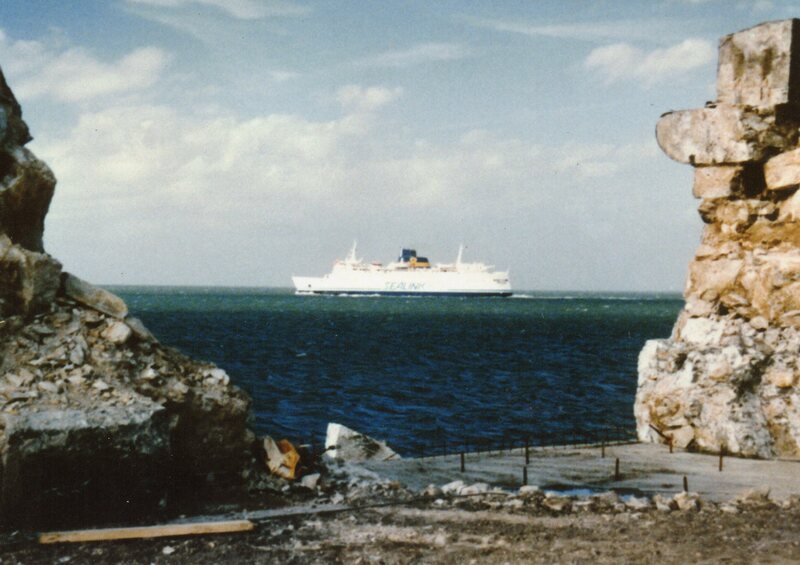 No Breakwater, no cruise ships! A breached Breakwater could mean delays and cancellation of ferries. The economy of Holyhead would be battered. 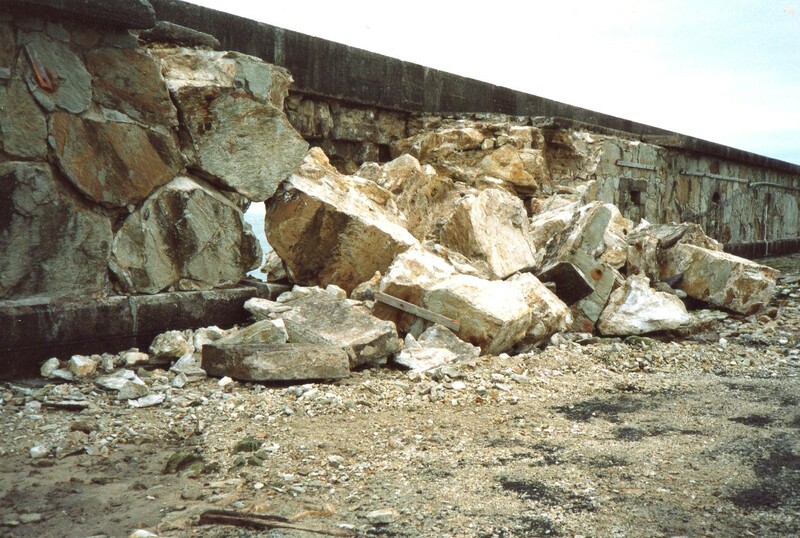 The fact is that the Breakwater is crumbling and requires urgent renovation. Maintenance has dwindled to virtually nothing over the past 10 or so years. 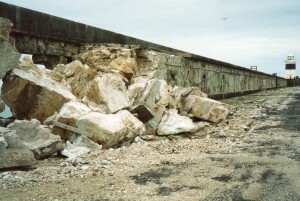 The Breakwater is currently beyond normal maintenance to make it stable and safe, and to retain its glory as a Grade II* listed heritage structure. County Cllr Raymond Jones who worked on the Breakwater as a Marine Yard apprentice recently walked along the Breakwater finding cracks in the granite. In one place he saw gaps between the wall and the floor. Cllr Jones fears that there will be a very serious breach soon as the lower sections are starting to sink. County Cllr Robert Llywelyn Jones is very concerned about the lack of maintenance and called for a meeting between the owners (Stena) and Anglesey Council’s heritage officer to discuss what they can do to preserve the Breakwater. 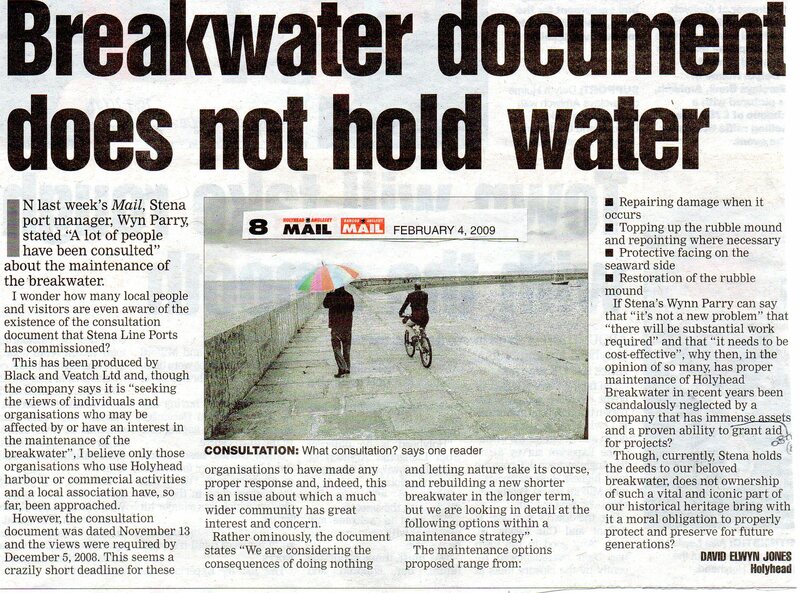 He points out that the Great Breakwater is a very important structure deserving of a Grade I listing. It is a unique structure; a magnificent masterpiece of Victorian engineering (Holyhead Mail 24th August 2011). 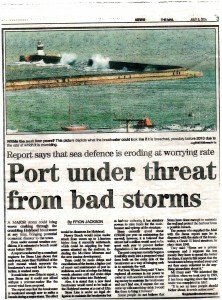 A spokesman for Stena Line said they are aware of the condition of the Breakwater following numerous surveys and that they are looking at the results of these with the objective of securing its long term future (Holyhead Mail 24th August 2011). 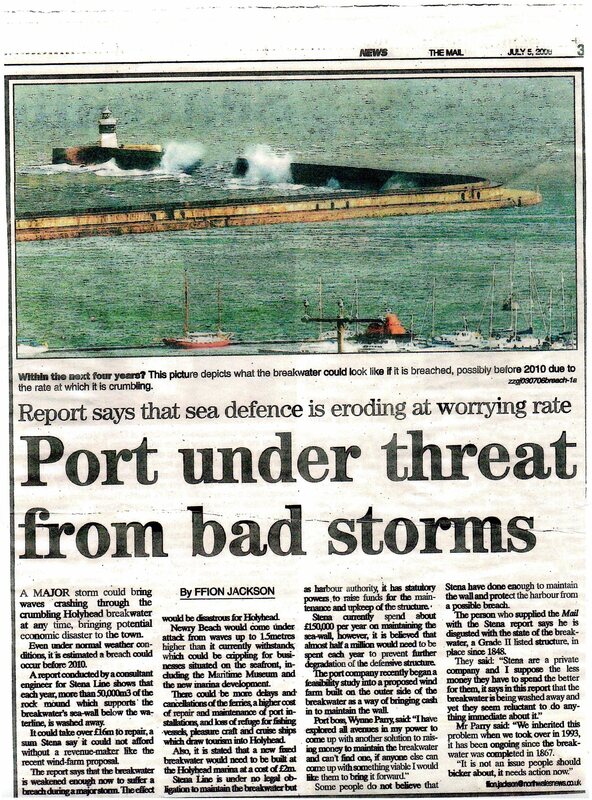 Anglesey County Council said (Holyhead Mail 24th August 2011) they will be asking the relevant officers to respond accordingly to the issues raised regarding the Breakwater because if there is no Breakwater there will be no harbour and the sea will flood Newry beach. They said that the owners, Stena, need to start investing in the maintenance of the Breakwater. 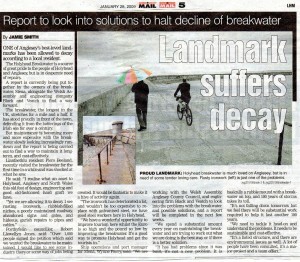 How can Anglesey County Council in November 2012 tell us that the Breakwater is safe!? 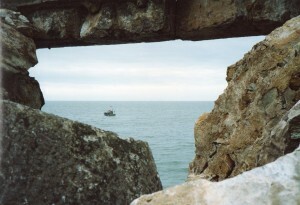 Worryingly, at a meeting held on 26 October 2012 between Anglesey County Council Planning officers and Conygar Stena to discuss provisional planning conditions and the 106 agreement, it was agreed that the Breakwater fulfils its functional requirements and therefore its maintenance is not a planning issue. How can Anglesey County Council agree to this after what they have previously said? How can Conygar Stena say the Breakwater fulfils its functional requirement despite the evidence which shows it is in danger of collapse? The Waterfront Action Group believes that before any further consideration is given to the plans submitted by Conygar Stena, the Breakwater must be made Great again; repaired, renovated and properly maintained. 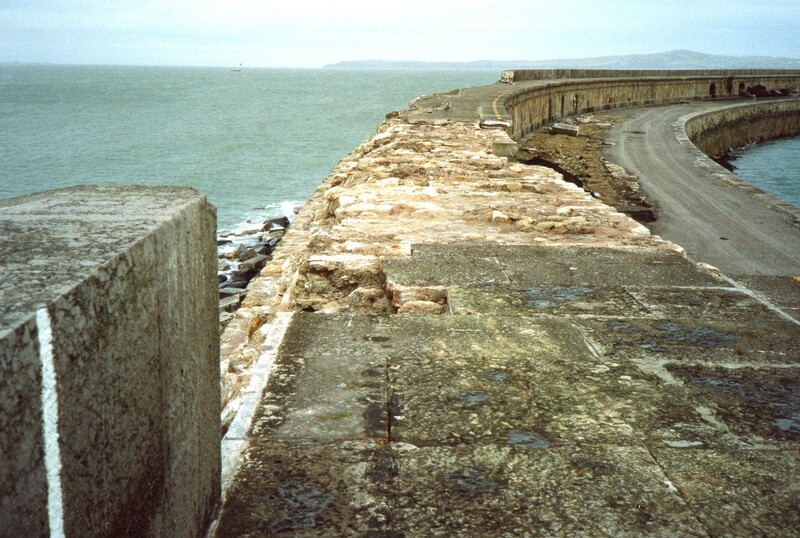 So who is responsible for maintaining the Great Breakwater? We understand it is Stena, as the harbour authority, who have a duty to maintain the harbour, to keep a navigable highway open for public use of all that choose to navigate it, and that they may do so without danger to their lives or property. We have been told that that Stena are under obligation only to keep a harbour of refuge. 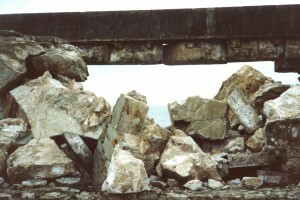 This does not necessarily mean maintaining the structure of the Breakwater, rather, just maintain its function. 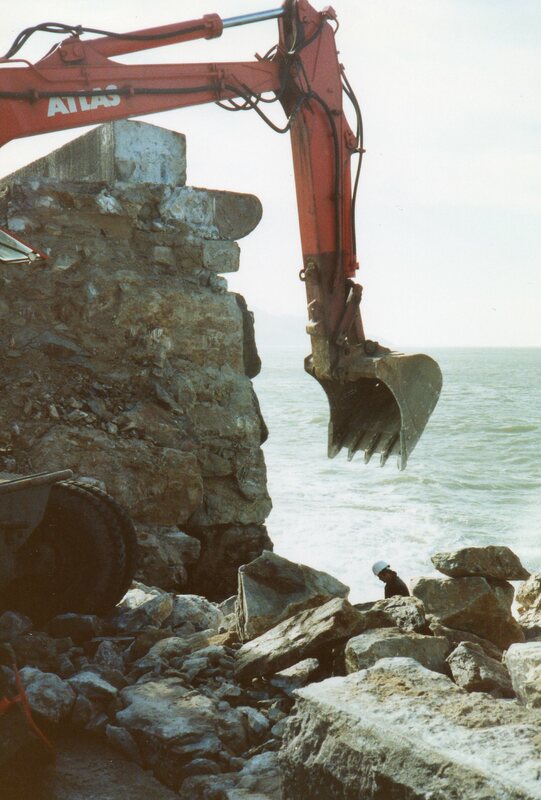 This could be achieved by depositing specially designed concrete blocks into the water on the seaward side of the Breakwater. Huw Lewis (Minister): Holyhead Breakwater is an exceptional listed building of national importance and, listed at grade II*, it is among the top ten percent of listed buildings in Wales. Anglesey County Council has front line responsibility for planning and listed building control rather than the Welsh Government and is therefore the appropriate public body to liaise with the owner about the maintenance and repair of the breakwater. While responsibility for addressing the condition of the structure rests with the owner, the Council has powers to intervene with statutory notices to remedy any adverse affect that the condition of the structure may have on the amenity of the area, to preserve the listed building and to protect health and safety. 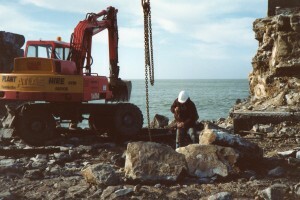 Stena has an annual investment programme in the structure and these works have been undertaken by Jones Bros of Ruthin. In 2009 Stena commissioned an Engineering study to investigate the condition of the structure and to explore viable maintenance strategies. Before Christmas my officials met with Stena and representatives of Bangor’s School of Ocean Sciences to discuss the need for a updated underwater survey to try and pinpoint areas of concern. This additional survey work is planned for the Spring. SO, ANGLESEY COUNTY COUNCIL PLANNING DEPARTMENT, UNDERTAKE YOUR RESPONSIBILITY TO PROTECT THE LIVES AND PROPERTY OF YOUR RESIDENTS BY REJECTING ANY PLANS FOR DEVELOPMENT IN AND AROUND NEWRY BEACH. TAKE UP YOUR DUTY TO ENSURE THAT THE OWNERS TAKE UP THEIR RESPONSIBILITY TO MAKE SURE THAT THE BREAKWATER IS RENOVATED AND DECLARED SAFE. PLEASE ENSURE THAT OUR WONDERFUL HERITAGE IS PRESERVED. Here are photographs of damage to the Great Breakwater taken by members of WAG. Yes it has happened and it will do so again. We do not have any photographs to show the known damage to the structure below the waterline.